Google Instant is now available for image search results, but only as an experimental feature. 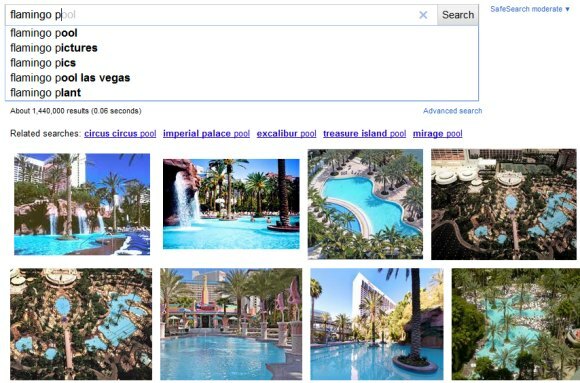 After you enable "Instant on Images", Google will start to autocomplete your queries and show image results before you finish entering the query. It's a great way to try different queries and see the results almost instantly. Unfortunately, there are some limitations that make this feature less useful. "Search by Image will not work if you opt into this experiment. Also, Instant on Images is available only if you already have Instant on Web. Finally, this experiment is enabled only for the Images search result page, not on the Google Images home page." You can try this feature without joining Google's experiment: just append &esrch=ImagesInstant::PublicOptIn to an Image Search URL, like this or bookmark this page. Google also added an experiment for Voice Search, which allows you to try the feature before it's available for you. Voice Search only works in Google Chrome 11+. Google says that you can't select multiple experiments at the same time, but I've managed to enable both Voice Search and Instant on Images. For some reason, you won't be able to use Search by Image when you enable Voice Search, even if Instant on Images is disabled. This Option will be a pretty time saving thing,hope it comes permanently soon. another experiment by google. It's wonderful!